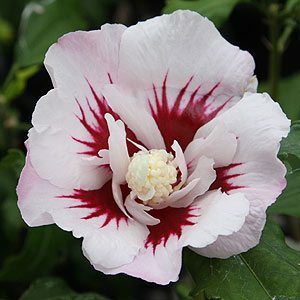 A cold hardy, upright deciduous plant Hibiscus syriacus grows to be a large shrub or small tree. Native to temperate areas of Eastern Asia Hibiscus syriacus is the national flower of South Korea and is also known as the Rose of Sharon. Large showy flowers as single or doubles also bicolors. Cold tolerant, frost hardy and with open flowers often with a dark centre. (see image of H.syriacus ‘Red Ensign’ below right). Not as spectacular as the evergreen Chinese Hibiscus Hibiscus rosa-sinensis however H. syriacus (Rose of Sharon) has a flowering period that is usually longer. A sunny position and a humus rich soil is best, keep well mulched and provide good drainage. Will grow to 2 – 3 m and prefers a sunny well drained humus rich soil. Once established this is a really low maintenance plant and pruning is easy, cut back while dormant by 1/3 each year to maintain at 1.5 to 2m in height and keep a nice bushy shape. Hibiscus syriacus can also be trained as a standard with little difficulty. All hibiscus syriacus all have red centres, however a number of forms are available. Although we do think that ‘red ensign’ is a standout. ‘Helene’ is a white form, again with red centred flowers. Other include Hibiscus syriacus ‘Diana’, Hibiscus syriacus and Hybiscus syriacus ‘White Chiffon’.